Mixing visual art and words has long been a passion for me. I often combine mixed media such as pastels--both chalk and oil--as well as oil sticks, photographs, stamps, labels, and a copper wire or bone here and there. My works on paper have a narrative quality, which has led me to my current focus of creating BookArts. 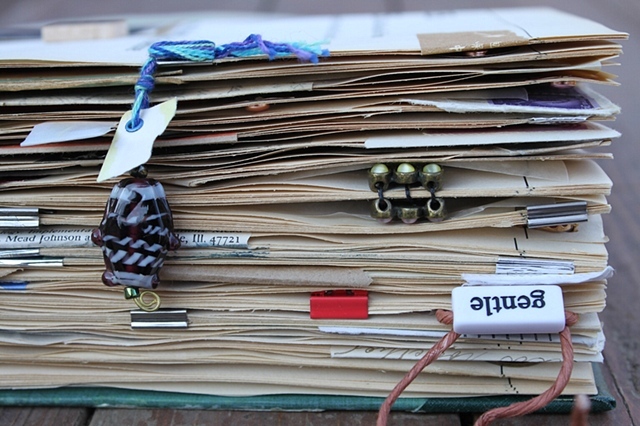 I impose an original story on top of a books existing text and illustrate it throughout with vintage photos, stamps, writings, wine foils, art images, and multiple other labels and wires and enclosures. Each book becomes a journey of exploration. Variating from this complete narrative approach, I also embellish and beeswax just a book cover, or a record album cover, or simply on kard,bord. Custom orders are available.